Hey guys! Are you waiting for this upcoming festival named as Eid-ul-Fitr? If yes, then surely you all needs to have new wardrobe stuff to enjoy this holy event. In such situation, there are number of designers working in clothing line to please their customers by unveiling their latest eid collections. All these assortment are designed according to this season and festive. It’s time to rush towards nearest designers retail store to grab the amazing piece for you. Stylish girls always need something new and fresh in designs and they search almost all designers to found the best piece for them. To overcome this problem, Sania Maskatiya is here to provide you people trendiest collection not only for casual wear but also for formal, semi-formal and even for bridal wear. [/li][/list]Sania Maskatiya is best known for her captivating, specialized and versatile prints and designs and craftsmanship on good quality fabric. Indeed, the team has its own printing, stitching and embroidery units with talented and skilled team. She has showcased her collection not only in Pakistan and India but also in International level like Europe and US. She has presented her series in PFDC and FPW in Pakistan and also having showcased at Lakme Fashion Week in India. The label is honored with Lux Style Awards for best achievement in Lawn and Luxury Pret respectively. Moreover, like other brand of Pakistan, She has keen sense of western culture and also touch its region culture. 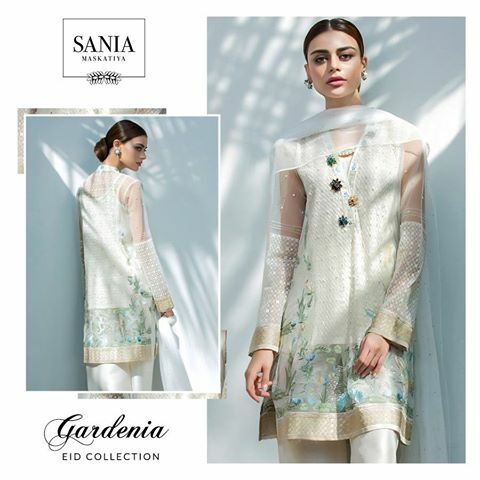 Sania Maskatiya Gardenia Latest Eid-Ul-Fitr Collection 2017-18 is adorned with intricate embroidered work is added in delicate style. For more embellishments, stones, pearls, motifs on front and back are added. This luxury Eid Collection contains almost 13 articles. Here are images posted below. The famous Sania Maskatiya has expanded its network both nationally and internationally at the same time. She has boast three stand-alone retail stores in famous city of country like Lahore and Karachi and next will be opens in 2017. Now, its time to to get the most richest designs of the year by S.M. Sania Maskatiya Eid Collection 2017 is enriched with unique lace patterns, neckline cuts and floral embroidered work on sleeves and borders. Each dress is quite expensive but by having this change your whole look. Indian Net shirt is embellished with chann of pearls all over, while neckline is adorned with stone buttons in floral pattern. An embroidered lace runs around the sleeve-cuffs and across the hemline enhances the grace of this dress. Indian net dupatta is adorn with Sequin border. This soft color dress is a perfect attire for this Eid. This Indian net fabric jacket is adorned with sequins laces with hemline. The inner slip is in crepe fabric featuring block print. You can also use plan silk slip inside. You can rock this event by wearing this beautiful masterpiece. Beautiful Sequins embellished shirt is patterned with zardoze and handwork on neckline in composed floral pattern. Pearl embellishment and organza fabric along with handwork runs along hemline, sleeves and cuffs. Slip is in crepe fabric. To add more glare this dress, light pearl chann dupatta with finishing touch of organza border. Hand work and pearl chann is added all over the shirt. Neckline and armholes are beautifully embellished with pearls. Hemline is designed with organza border. Delicate Indian net dupatta is part of this masterpiece. Straight pant is in raw silk with hand work. This net shirt is adorned with Sequins sprayed all over. Zardoze work is added in front and back to add more grace to this shirt. The sleeve-cuffs and hemline are finished with organza border. 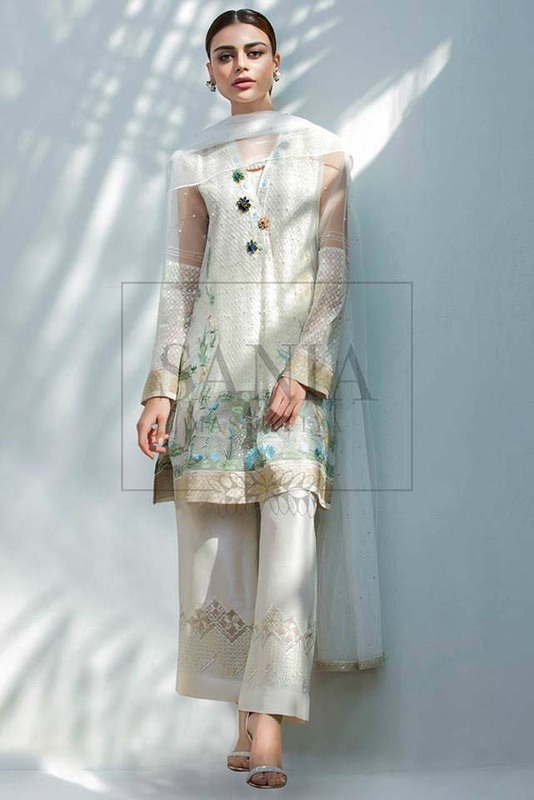 Raw silk ezar featuring sequins embroidered bottom and net fabric dupatta is part of this. Cotton net sequins embroidered long shirt featuring floral bunches of embroidery on the top. Neckline and armholes are highlighted with stones. Sequins border along the hemline adds to the detail. This beautiful shirt is featured with hand work along with neck. The embroidery work is done all over the shirt to add more glare, while armholes embellished with pearls whereas the hemline is adorned with organza border highlighted with tassels and pearls. Long flared top featured with Indian Top and crepe bottom. Decent and delicate zardozi work is added along with neckline, sleeves-cuffs. This beautiful attire is perfect for evening wear functions as well. This exclusive peplum top is composed of stones bunches around the neck and shoulders. A belt around the waist giving it a waist belt top look. Trouser is adorned with net lace. Chiffon embroidered top featuring floral embroidered bunches on one shoulder. A crepe lace runs along the hemline on the front side. A belt embellished with pearls and stones around the waist adds to the grace. You can carry this dress not only as festive wear but also for occasional wear. This beautiful crepe embroidered Kimono top is featured with zardoze work along shoulder on one side while other shoulder is kept simple. This pretty shirt is adorned with floral embroidery on the front side with addition of stones in floral patterns. In addition to it, floral embroidery is also added along hemline with touch of pearls. Pencil trouser on the other hand is also designed with buttons. Crepe sequins embroidered top is featuring with floral embroidery at the front and giving cape style dress. On the other hand plain raw silk pant is part of this dress. Beautiful beaded net dupatta is enhancing the charm of this dress. Sania Masktiya Eid Collection is now available at all its leading retail stores in nationwide. 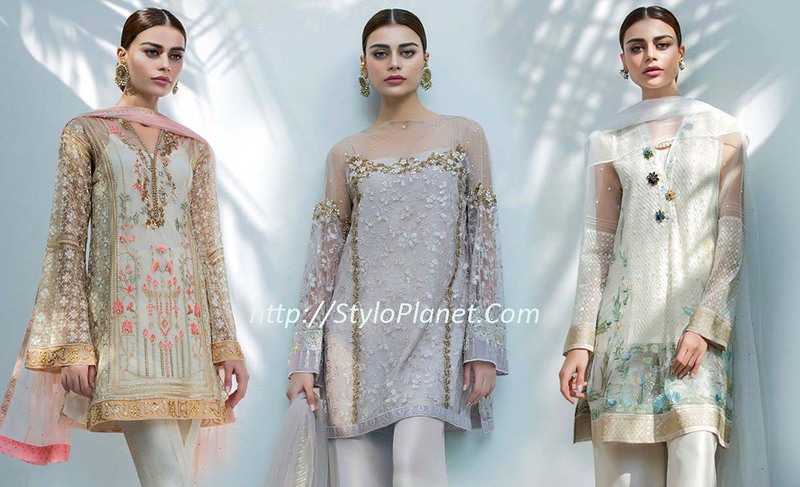 All these dresses are Indian embroidered net paired with raw trousers.